Even if you have never ridden a motorcycle with a sidecar, you can tell just by looking at one that it is a whole different type of riding. Like bringing an extra friend on a date, that third wheel alters the ride, which can make for some awkward situations when you first take a sidecar out on the road. An often unexpected phenomenon is that the sidecar wheel has a tendency to leave the ground in hard right turns. This is known as "flying the sidecar" and is something that all sidecar riders have to learn how to handle. More than 100 years ago, Hugo Young realized that having your sidecar wheel in the air instead of on the ground was potentially dangerous for both the rider and the passenger. Being an entrepreneur and an inventor – as well as a dealer for Harley-Davidson motorcycles – Young came up with a new design to keep all three wheels on the ground at all times. 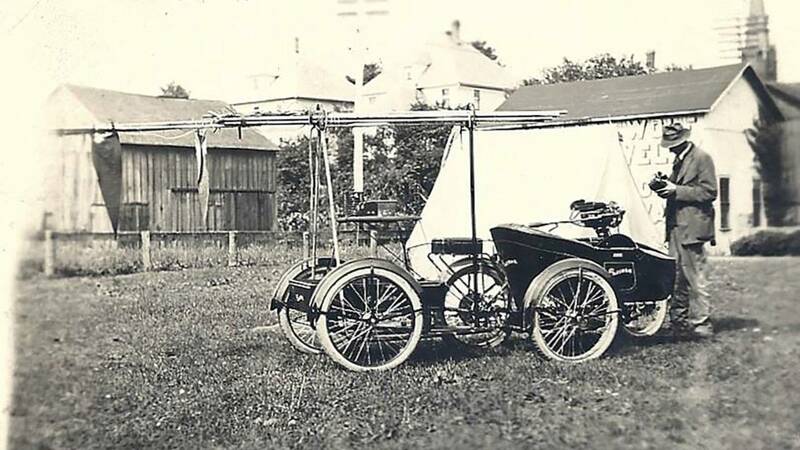 Young's design allowed for much more "flexing" than with a traditional rigid mount sidecar. Photo courtesy of the CRF Museum / Mohican Historical Society, Loudonville Ohio. 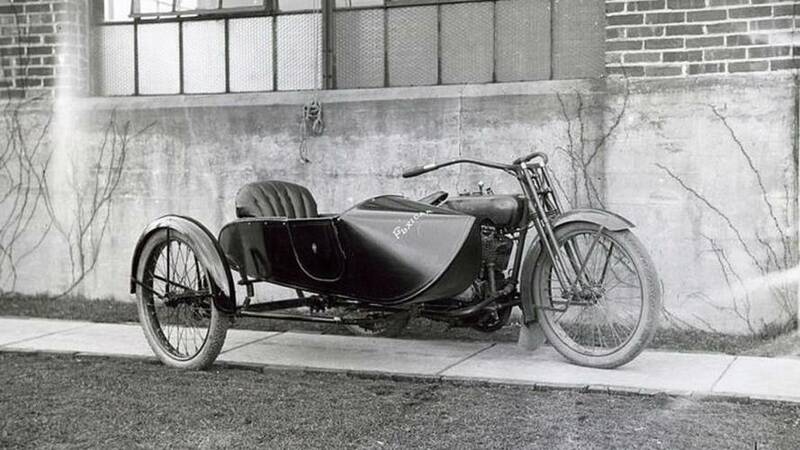 In 1912, Young built his first prototype sidecar, which incorporated two new innovations he would later patent. The first was a flexible connection between the sidecar and the motorcycle that was paired with a redesigned tilting sidecar wheel. The combination allowed the sidecar to lean with the motorcycle, something that no other sidecar could do. The tilting wheel could also move up or down in relation to the motorcycle's wheels. So, for example, if you ran over a dead opossum on the side of the road, the sidecar wheel would travel up and over said roadkill without affecting the lean angle of the motorcycle. The true benefit of this design was that the sidecar no longer dictated how the motorcycle would handle, but instead took its cues from the motorcycle. 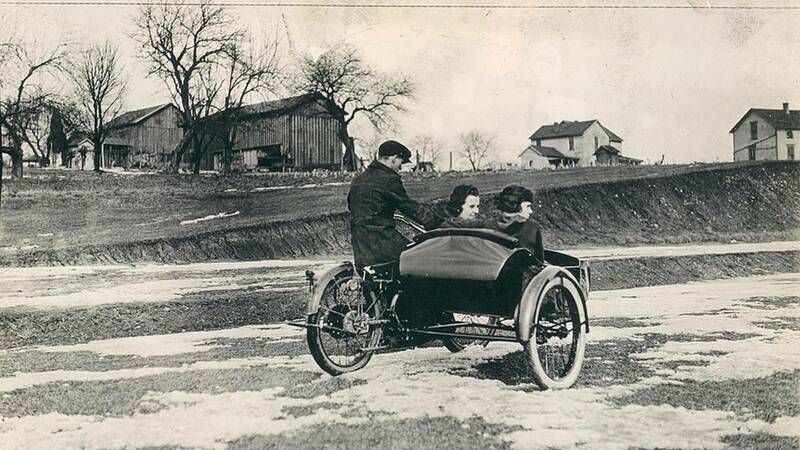 At the insistence of a traveling salesmen, Young founded the Flxible Side Car Company in 1913 with Carl Dudte. They purposely used the misspelling of the word "flexible" in their name so that they could copyright and trademark the word "Flxible" (common adjectives cannot be copyrighted or trademarked). The company was incorporated in 1914 and moved to a rented factory in Loudonville, Ohio. This move turned out to play a pivotal role in the history of the company as it brought them in touch with Loudonville native Charles Kettering. Testing two Flxible sidecars on one motorcycle. Not practical for riding, but gets the point across. Photo courtesy of the CRF Museum / Mohican Historical Society, Loudonville Ohio. Charles Kettering is no longer a household name, but you probably have heard of the company he founded, named the Dayton Engineering Laboratories Company. That might not ring a bell either, but take the company's initials and you have the acronym "Delco," which anyone who has worked on a GM-based automobile is quite familiar with. Starting with redesigning Cadillac ignition systems in 1908, Kettering went on to design and build one of the first automobile "self starters" in 1911, and by 1916 had been bought out by General Motors to the tune of $2.5 million. With his new found wealth, Kettering decided to give back to his hometown by investing in Flxible with the stated purpose being to "develop in Loudonville a self-sustaining organization that could go and build and market a product." 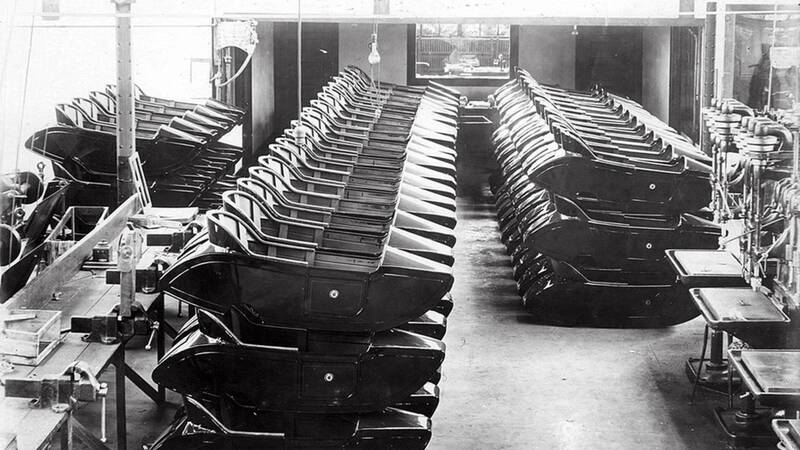 Sidecar bodies stacked up at the Loudonville factory. Photo courtesy of the CRF Museum / Mohican Historical Society, Loudonville Ohio. The injection of new capital into Flxible allowed them to build a new factory, which opened in January 1917. They hired 50 men to run the factory and were expecting production numbers to reach 350 units per month by March of that same year. Of course, this all went out the window with the advent of World War I, but like many US companies, Flxible adapted by going after government contracts to support the war effort. Oddly, this contract was for rigid sidecars mounted to Excelsior motorcycles. 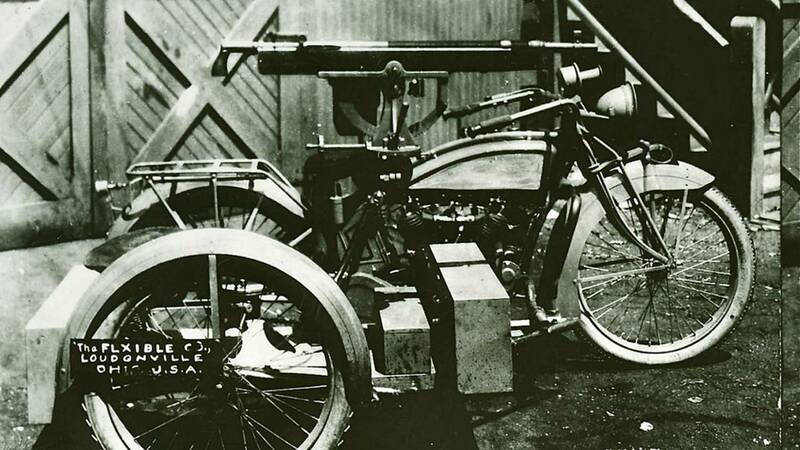 The sidecars were also equipped with Hotchkiss machine guns, so a leaning sidecar probably would not perform as well during live fire. Rigs like these were used by American forces in France during WWI. While firing from a stationary position, wheel chocks were necessary to keep the entire rig from rotating. Photo courtesy of the CRF Museum / Mohican Historical Society, Loudonville Ohio. After the war, Flxible moved back to civilian sidecar production and by 1919 was the world's largest exclusive manufacturer of motorcycle sidecars. Part of its success was due to the thrilling sport of sidecar racing, which was extremely popular throughout the United States. Flxible's sidecars were used by all the leading motorcycle manufacturers including Harley-Davidson, Indian, Excelsior, and Reading-Standard. 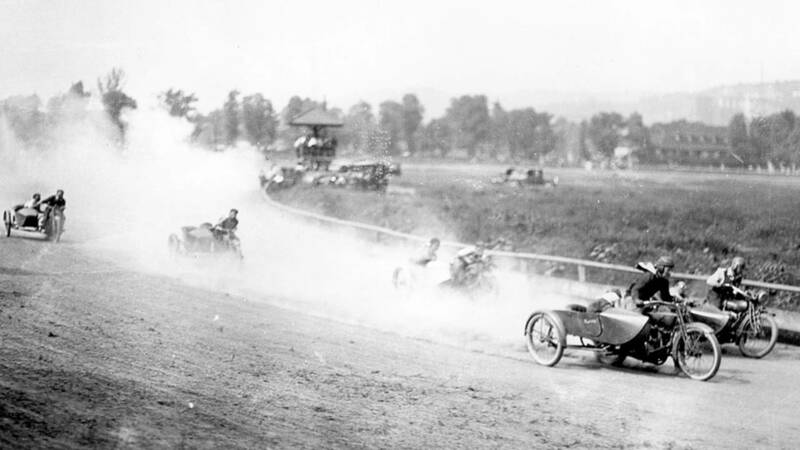 Also in 1919, motorcycles using Flxible sidecars took first, second, and third places at Sheepshead Bay – giving Flxible the National Championship for the year. 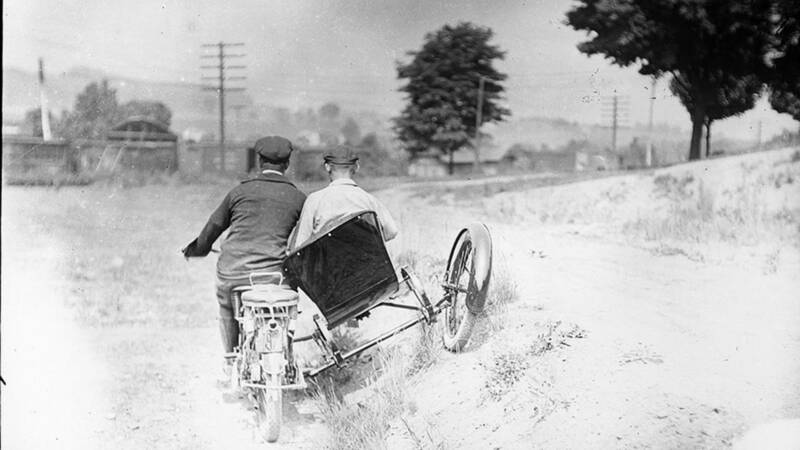 Two years later, in the summer of 1921, all sidecar races were won by machines using Flxible sidecars and it seemed like Flxible had a bright future in the sidecar market. Flxible sidecars "dusting" the competition. This was actually a fairly effective strategy, get out front early and blind your competitors. Photo courtesy of the CRF Museum / Mohican Historical Society, Loudonville Ohio. Leading up to the Great Depression, the motorcycle industry took a major downturn. The key factor was the increased production of cheap automobiles like the Ford Model T. The cost of these new automobiles was slightly less than many standard motorcycles, but was dramatically less when you added in the price of a sidecar. Plus, let's face it, there are many tasks to which cars are better suited, so the rise of the automobile was inevitable. Hugo Young was not ready to throw in the towel just yet and starting looking for other product lines to expand into. 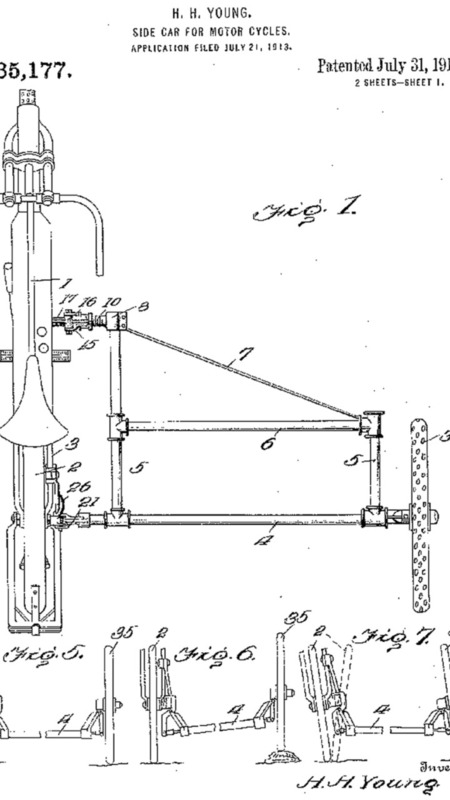 These ideas ranged from a copper-cooled motorcycle motor (used copper cooling fins welded to the motor) to electric dishwashers. 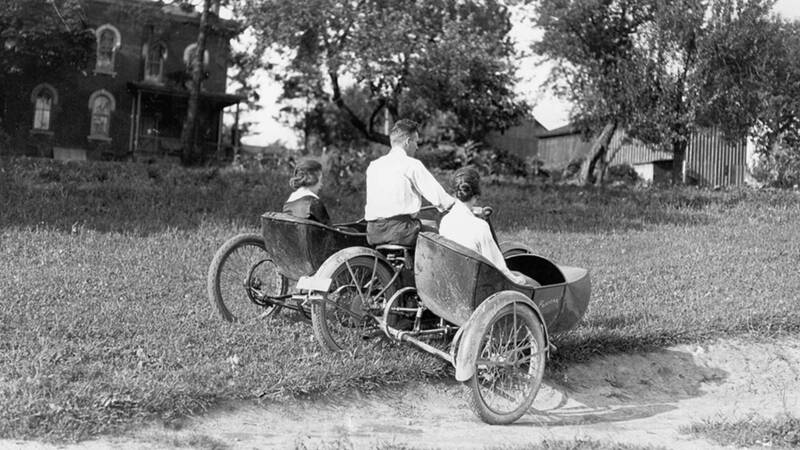 Even with a wide body sidecar, motorcycles just could not compete with the automobile when it came to "family transportation". Photo courtesy of the CRF Museum / Mohican Historical Society, Loudonville Ohio. In the end, the idea that saved the company was to move into the specialty automobile business, specifically building buses, ambulances, and funeral cars. This may seem like a drastic departure from sidecars, but the tooling needed to shape sheet metal for sidecars turned out to be up to the task of doing the same for buses. Flxible used chassis and drivetrains from other auto manufacturers, so its main focus was on building and installing the custom bodies, which were made to order based on the specific needs of their customers. 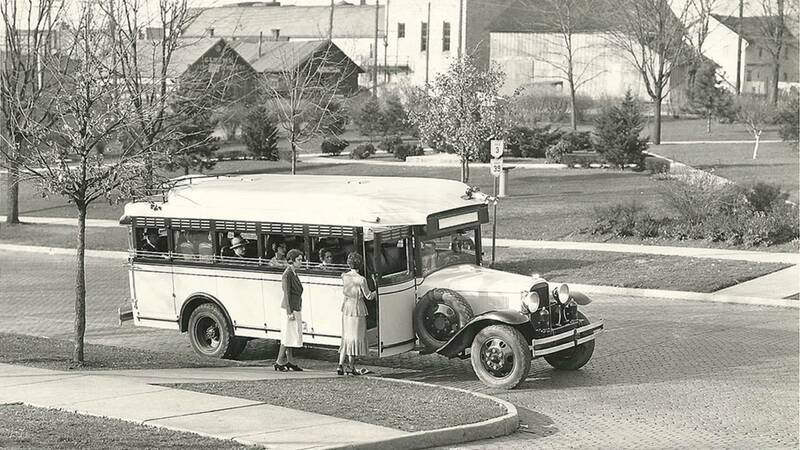 By the end of the 1920s bus body production made up almost 50 percent of Flxible's total sales, while sidecar production dropped to less than 2 percent. This interesting rig was built for a couple traveling around the world. It included a Flxible sidecar as well as trailer built at the Flxible factory for hauling radio equipment. Photo courtesy of the CRF Museum / Mohican Historical Society, Loudonville Ohio. It is not clear when the last Flxible sidecar rolled off the line in Loudonville, but it is safe to say that no more sidecars were produced after the 1930s. Flxible had shortened its name in 1919 to the Flxible Company, which only helped with the transition from motorcycles to automobiles. Although Flxible built various vehicles throughout their history, their most successful product lines were various buses they produced over the next 70 years. With nautically inspired names like the "Clipper" and the "Starliner" these machines transported thousands of Americans across town and country. Example of an early Flxible bus, built using a custom body mounted on a lengthened car chassis. Photo courtesy of the CRF Museum / Mohican Historical Society, Loudonville Ohio. After 83 years in business, Flxible declared bankruptcy in 1996 and closed its doors for good. Even though motorcycles had dramatically risen again in popularity since their decline in the 1920s, Flxible never went back into the sidecar market from which they got their start. 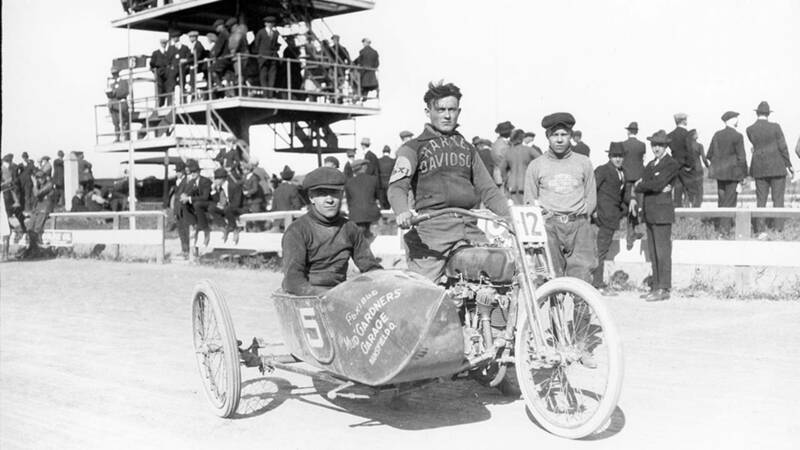 Like many of the highly dangerous forms of early motorcycle racing, sidecar racing was banned in 1925. This, along with sagging motorcycle sales, led to the demise of the Flxible sidecar. Photo courtesy of the CRF Museum / Mohican Historical Society, Loudonville Ohio. Special thanks to the Cleo Redd Fisher Museum who provided the photos and helped with my research of the Flxible Company. They are located in Loudonville and have an original Flxible sidecar on display along with many more original photos and documents covering the entire history of the company.